We departed Marrakech this morning (after yet another trip to the supermarket to resuppy our gin) and after navigating our way out of the city we headed toward a piste recommended by the Frederick in camp. Tomorrow is the festival of Eid al Kabir, which involves the sacrificing of sheep. There was a lot of traffic on the road, much of it people heading home for the celebration. Many vehicles had sheep on them destined for tomorrow’s dinner. We crossed over Tizi-n-Tichka pass (2260m), and after waiting for a minor bus accident to clear, we turned off on a side road toward Telouet. After 20km the pavement ended and we continued along a dirt road, passing many villages. After about 30km the sun was setting and we decided to make camp where we were rather than continuing on to the promised campground at the end of the route. We pulled off onto a desolate plateau below the ruin of a Berber fort and made dinner. We were concerned that locals would bother us (asking for money, payment to camp, etc) and in fact one man made the 500 meter trek from the road out to the campsite. He said hello in Arabic and asked (in French) for a bottle of water. We gave him one and he smiled and walked off. I think the water was a pretense for coming to look at our camp. He didn’t say much and was very polite, shaking all our hands (as is the custom) before departing. We ate our dinner, cleaned up, and went to bed under a clear sky with a bright moon. 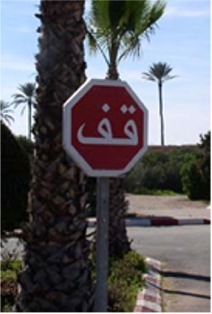 A Moroccan street sign. We’re pretty sure this means, “Tap your brakes twice, then keep moving.” (read right to left in Arabic, of course). A village and terraced farmland along the piste. Our "bushcamp." The wall of the ruin can be seen at the top of the hill. After a cold clear night, we awoke to yet another sunny day. Witt took a short hike up the hill to the ruins while Graham made coffee. After packing up camp, we continued on our way at about 930am. We passed through several villages with the children running after the cars asking for sweets, pens, or anything they could think of. This behavior is the unfortunate result of previous travelers’ generosity. Difficult though it was, we did not give anything out. 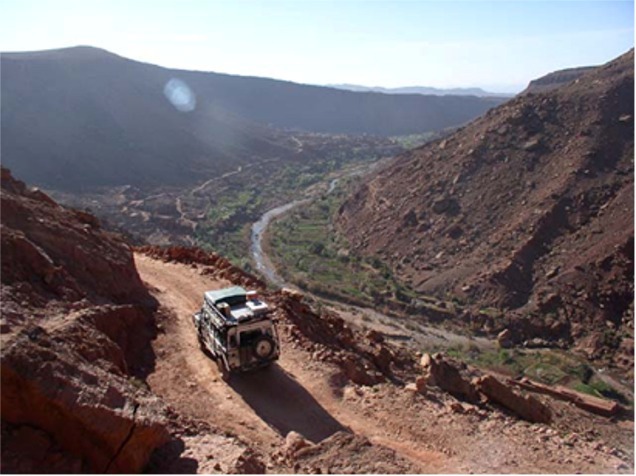 By 1130 we were on pavement again and set out for Zagora along a highway that runs vaguely through the vallee du draa. 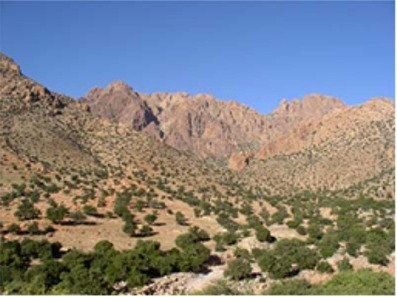 The landscape is incredibly barren, with rock-strewn hills and sparse vegitation. There is striking evidence of geological uplifting, with vast curved rock ledges running across the hills. The villages we passed through on the main road were at first eerily empty of people. Then later in the day, we saw people standing at the side of the road talking. Inevitably they were dressed very well, with men in long white or brown robes and the women in amazing colorful garments that contrasted with the surrounding reddish brown soil and buildings. 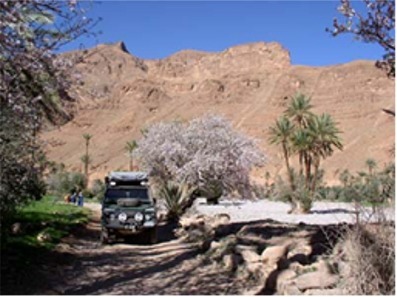 We arrived at our destination in Zagora at about 430 and easily found the campsite recommended by lonely planet. With the symphony of barking dogs, braying donkeys, a catfight and the obligatory 6am call to prayer, none of us got much sleep last night. We awoke and went to get our tire repaired in what seems to be a ritual we perform every few days. 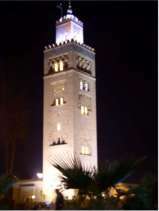 Once that was done and after a little shopping and some petit dejeuner in Zagora we topped off our tanks and headed for Mhamid and the start of our second piste. Zagora is (or was) apparently traditional stop on the route to Tombocktu, for there is a sign in town which claim it takes 52 days to reach that desert oasis from Zagora by camel. The town also seems to be a tourist hub for those seeking camel, 4x4, or ATV trips into the desert. We arrived in Mhamid just before lunch. We were unable to stop in town to discuss our route without being accosted by tour guides (driving Land Rover 110s) offering their services. Apparently the widespread use of GPS by independent travelers has hurt their business. Unable to convince them that we did not desire their services, we turned to our own GPS and made for the first waypoint. As soon as we were far enough from town, we stopped for a lunch which was hastened by swarming flies. This reminded me very much of Alice Springs, Australia. Another guide came by on a motorbike from the opposite direction. He was less insistent and chatted with us for awhile. After I declined his generous offer of 50 camels for my Land Rover, he rode off. The first 10km on the piste were sandy, then the terrain became more rocky as Chris Scott (the author of our guide book) promised. At one point we had to adjust course cross-country as the track we were following was veering too far to the south and too close to the Algerian border (only about 30km away). Gotta love that GPS. We re-gained the piste and followed it for about 50 km before making camp amongst some small dunes. 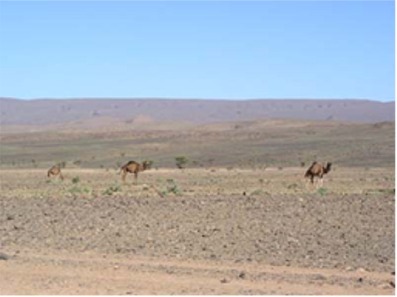 Shortly after starting dinner preparations, a camel herder walked into our camp from the desert. Dressed in a tattered robe and headscarf, he certainly looked the part. His face was dark, weathered, and leathery and he spoke no French. We offered him a cup of tea, sweetened with an obscene amount of sugar as it is traditionally served here. He sat down and we attempted to communicate using sign language and our Moroccan Arabic phrase book. We gave him a cigarette, which he smoked, and then got up to leave. 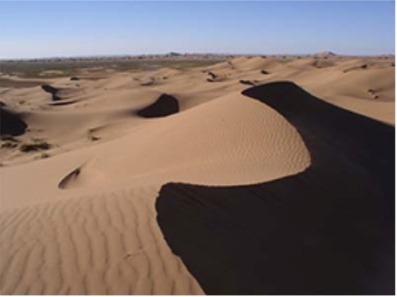 We all shook hands, then he walked up the crest of a dune, his headscarf blowing in the wind, and disappeared back into the desert. We finished our dinner and washed up, then spent a little time star gazing and strolling about in the sand by the light of the nearly full moon. I climbed to the top of a dune and could see for miles. There were no artificial lights to be seen, nor did we see or hear a single aircraft overhead. 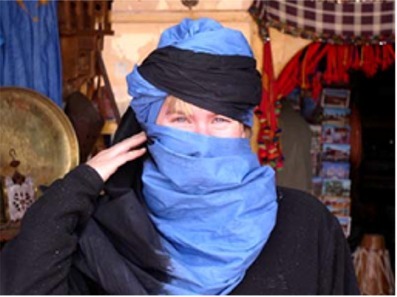 Jen trying on a headscarf in Zagora. It was so quiet last night that we could actually hear the hum of our refrigerator from inside the tent (the fridge is pretty quiet). We got a very peaceful night’s sleep and awoke to another sunny day in the desert. After making coffee and museli for breakfast, Jen and I went off to climb a nearby sand dune. We broke camp and started driving at about 10am. We saw many camel herder’s camps, with the children running sometimes hundreds of meters over stony ground to ask for “un stylo” or “un bonbon.” It becomes very tiresome, but at the same time it’s understandable give how little these people have compared to us. We stopped at a police checkpoint and chatted with the officer there. He told us he’d been stationed there for a year and a half and we were the first Americans he had met on the piste. He said that he didn’t see much in the way of fresh fruit or girls out there, so we gave him some cookies and a few oranges. We couldn’t help in the “girls” department, as we hadn’t brought any extras along. We pulled off into some dunes for a rather gritty lunch. Another couple of hours and we arrived back on the tarmac near Foum Zguid. We drove a further 120km to Tata, where we sandwiched ourselves in with a bunch of European retirees in RVs. Morocco seems to be the Arizona of Europe, except that “Campground” seems in most cases to mean a walled in parking lot. We left the campground at Tata this morning at about 10am and started another piste from Chris Scott’s book. They’ve paved some of the route, which cut off some time, but we still had about 50 km of dirt track. The pavement ended in a village (Souk-Tleta-de-Tagmoute) and the track wound through town for what seemed like forever. We drove up a river valley full of palm trees and amazingly green grass. There were several villages and lots of people, and in marked contrast to the last piste, the people were very friendly, saying “bon jour” and “bon voyage” and only a few of the children asked for handouts. At one point a few kids jumped onto the back of our truck and went for a ride. They thought it quite funny when Connie climbed on with them. We climbed up 3500 feet on a switch-backing trail then wound across a plateau before regaining the tarmac. 80km later we were in Tafraoute. The town seems quiet and fairly low-key with few touts to hassle and loads of European retirees in RVs. The one campground in town, like in Tata, is a walled compound with RVs parked as in a parking lot. Just outside the campground is a large area of much more inviting bush camping. There are probably twice as many RVs out here as are in the campground. There is great opportunity here for someone to buy some land and put in a proper campground. We walked into town for an excellent Moroccan meal consisting of a traditional soup, a tagine dish, and dessert with sliced oranges topped with a bit of honey and cinnamon. The mountain & desert oasis along the piste. Local kids riding on the back of our quatre-quatre (4x4).